Dunkirk: The Men They Left Behind is a new and controversial study of one of the most enduring tales in modern British history – the evacuation of the British army from Dunkirk in 1940. However, whilst previous books have focussed on the miraculous escape of over 300,000 men across the English channel, this book switches the attention to the 40,000 British soldiers who did not escape. For these men the story of the Dunkirk evacuation was not about ‘victory’ but about defeat. The book follows the fortunes of these men through their training, the phoney war and their experiences in the battles leading up to the evacuation from France. It then focuses on the fate of three groups of men left behind. The first group are the evaders who make their way through the French countryside, attempting to steal boats to row across the channel or to reach home via neutral countries. The second are the wounded men. The book follows their experiences of the varying standards of treatment given by the Germans. It also reveals the fate of the doctors and medics who remained behind to look after them. The third, and most numerous group, are the prisoners of war. For the first time ever the complete details of the horrors of the march by POWs into Germany is revealed. The book reveals the beatings, starvation and murder endured by the marching prisoners. After their arrival in the POW camps of Germany, the book follows their experiences through five years of imprisonment. It also details the repatriation of wounded ‘Dunkirk’ POWs who were returned to the UK in 1943. The book creates a vivid picture of how the myth of the ‘victory’ at Dunkirk means so little to those soldiers who did not escape – men who continue to feel embittered that their sacrifices went unnoticed and unrewarded. "...a long overdue account of the 40,000 soldiers unable to join the rescue armada who were taken prisoner...Longden’s beautiful research – which centres also on those who reached home to fight again – is a tribute to the “forgotten men” of Dunkirk." 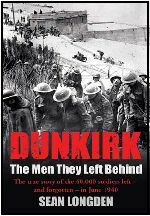 "Longden uncovers some remarkable and poignant individual stories in what is a moving and fascinating antidote to the Dunkirk legend. First class history." "The story of those unsung heroes, the 40,000 British soldiers the Dunkirk armada left behind. They fought and died like lionhearts, many being taken into captivity - so that the British war effort might live on. We owe them all a debt of freedom, and this book is a fitting tribute to their sacrifice. At times shockingly frank - this was no gentleman's war - this is a story that needed to be told. Sean Longden tells is admirably well." "Sean Longden's fascinating history fills a gap that ought to have been plugged long ago and reminds us that the Dunkirk miracle didn't work for everyone." "A meticulously-researched, very well written and deeply moving account of the experiences of the forty thousand British soldiers who fell into German hands during the Dunkirk campaign, men who spent the next five years being pushed to the very limits of human endurance, and sometimes beyond." 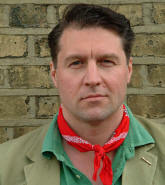 "Sean Longden is a rising name in military history, and is able to uncover the missing stories of the Second World War." "...as interesting as Saving Private Ryan." "...few readers will be unmoved by Sean Longden’s account." "A moving and fascinating antidote to the Dunkirk legend." "His book cannot fail to elicit sympathy for their suffering and admiration for their sacrifice." "...gritty emotional and shocking … It has changed my understanding of life for British POWs in the Second World War."